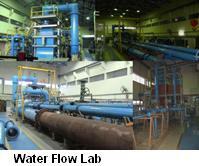 The main activities of water flow laboratory include calibration and testing of flow products in water. Products covered includes all types of flow meters, valves, water meters, pumps, water conveyance pipe and fire fighting equipments. The water Flow laboratory works on the gravimetric Static Weighing Method. This method is as per ISO 4185 and here the flow meter is calibrated to the highest accuracy by weighing the quantity of water that passes through the meter during a known time interval. The laboratory is designed to handle a maximum flow rate of 4500 m3/h and a maximum pressure of 10 bar. Pipes upto 900 mm NB diameter can be accommodated in the system. The test rig has different test lines sizes up to 900 mm NB and the laboratory is capable of extending the line size upto 1200 mm. A large underground sump of 370 m3 capacity is used to store the required water. 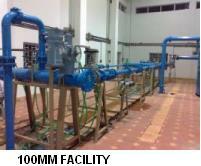 The test rig is supplied with water at constant head from an over head tank of 50 m3 capacity and 18 m head. During operation the constant head tank (CHT) is continuously overflowed using different low pressure pumps, which can be selected according to the requirement of the test meter. Weighing tanks of capacities 30 kg, 300 kg, 2000 kg and 20000 kg are made available for the flow measurement. Diverter systems are used to divert the flow to the weighing tank for an accurately measured time period (flying start and stop method). The mass measurement is by high precision electronic balance/load cell. Time is measured using universal counter which is triggered by a photo switch connected to the diverter system. A set of high precision differential pressure transmitters are available for the measurement of pressure drop. Resistance temperature detectors are used to measure the water temperature. The density of water at flowing condition is measured using an online density meter. Together with measurement of density at the moment of each diversion enables mass readings, after correction for buoyancy, to be converted into volume. The volume is divided by the respective diversion time to obtain accurate measurement of flow rate. The laboratory has been accredited by National Accreditation Board for Testing and Calibration Laboratories (NABL) and also has ISO 9001 certification.. 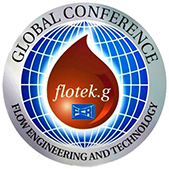 Considering the requirement of a high accuracy (± 0.1%) set-up for calibrating new generation flow meters and the heavy demand in the existing Water Flow Laboratory, especially for sizes upto 100 mm, an advanced high accuracy water flow laboratory to accommodate meter sizes upto 100 mm, a maximum flow rate of 250 m3/hr and a maximum pressure of 3 bar has been set up and commissioned in the month of October 2005. 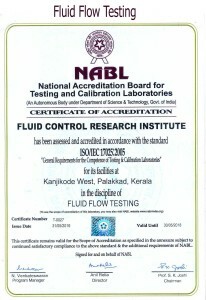 The laboratory is accredited by NABL for testing and calibration and by W&M for model approval of flowmeters. The essence of this project is to assist Department of legal metrology in setting up a secondary flow measurement facility. The project is expected to assist process industries, state water boards, oil sector, thermal power plants, fertilizer, petro chemical Industries etc.The maximum flow rate achieved is 250m3/hr at 40m head. The facility was designed on the basis of transfer standard, which is to be traceable to FCRI. In principle, the transfer standard is proved against the static gravimetric system of FCRI. The transfer standard of measurement is designed to achieve accuracy better than +/- 0.2% in volume flow rate.The maximum flow rate required for testing 100mm NB meter is estimated to be 250 m3/hr. This can be achieved by the flow from pumps running in combination. In this inter-laboratory comparison program, the gravimetric water flow measurement facility of FCRI was compared with the gravimetric flow measurement facility of TUV NEL Ltd., UK. An eight inch NB orifice plate assembly was used to compare the performance of the flow measurement standards. The discharge-coefficient (Cd) of the orifice plate assembly in the Reynolds number range of 3.4 × 105 to 1.2 × 106 was determined by FCRI India and TUV NEL UK. Since it is the requirement of ISO 17025 accreditation En Numbers were estimated for the mean cd at each Reynolds number and it was observed that the En numbers were less than one in all cases. 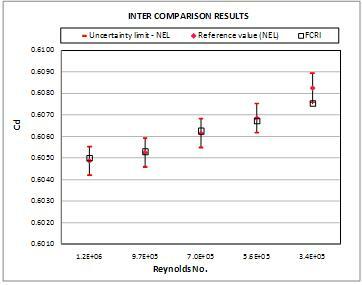 Hence it has been proved that the FCRI results are well comparable with International systems and the system reproducibility over a period of time is good. Three Duel flow dispenser valves of size 15mm NB from M/s. Parker Hannifin India Pvt. Ltd., Mumbai was tested. Flow test and response time test were tested as described below. The discharge through the valve at various upstream pressures was observed. Pressure tapping was given at an upstream distance of 2D from the valve. The current sensor output was interfaced to a high speed DAS system and data are captured on a computer at desired sampling speed. The output from a high response line- static pressure transducer and a flow meter are also interfaced to the DAS. During test, for a set operating condition for pressure, the valve under test (VUT) is operated from OPEN to CLOSE (low flow to close). The current, pressure and flow are monitored on DAS during the process. When VUT proceeds to closure, pressure pulsations (water hammer effect) are observed (refer Fig 2,about instance B). 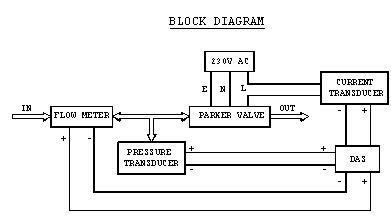 As the VUT moves from OPEN to CLOSE state, flow of media past the VUT is being recorded by measuring the flow signal (pulse output from flowmeter) transitions to zero flow within a short interval. Fig.3 indicates leakageflow past the VUT since instance A (obtained from fig 3). Water draw calibration of a 12” Compact Prover, Pycnometry and meter proving was conducted, as per API MPMS, at FCRI for M/s Daniel Measurement Solutions Pvt. Ltd., Baroda. The Base Volume of the compact prover was established by water draw method. 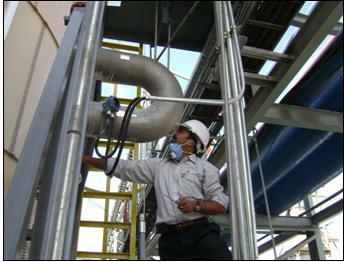 The prover was then installed at site for proving of custody transfer flow meters. One of the biggest venturimeter of size 48“ NB was calibrated at FCRI. The venturimeter was designed and manufactured by M/s Instrumentation Ltd., Palakkad. The venturimeter was calibrated for coefficient of discharge and performance was evaluated. • The average value of Cx must be equal to 1.0054 ± 0.0025, i.e., the average value must be in the range 1.0079 ≥ Cx ≥ 1.0029. • The absolute value of the slope of the Cx must be less than 2.7 x 10-10. • The scatter of the calibration data shall be within ± 0.0003 from the regression line of Cx. 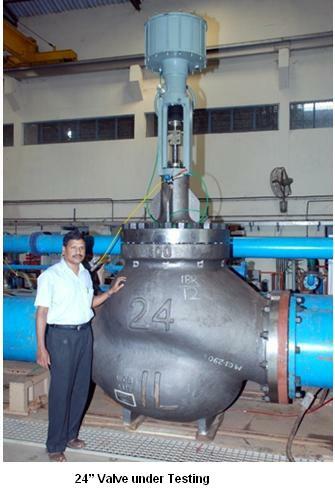 Large size valves upto 24” size were tested for M/s. Instrumentation Ltd., M/s. Flowserve Controls India Pvt. Ltd., M/s. Severn Glocon (I) Pvt. Ltd. and MIL Controls Pvt. Ltd. Different sizes of pitot tubes of sizes 50 mm to 450 mm were calibrated for M/s. Indira Gandhi Centre for Atomic Research, Kalpakkam and Nuclear power corporation of India, which was supplied by different manufactures like Starmech, Benchmark etc. One 4”NB coriolisis mass flow meter from M/s. 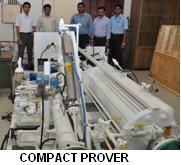 Indian Oil Corporation Ltd. was subjected to 24 hrs continuous flow performance test. The readings were observed online as well as for fixed intervals. The mass flow accuracy was found out in fixed intervals and for the total inventory. Calibration of custody transfer flow meter was done at M/s. Speciality Minerals Namphong, Khon Kean, Thailand. 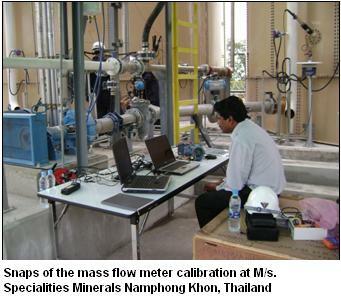 The custody transfer mass flow meter of size 4”was calibrated using master meter method. The FCRI reference master meter was calibrated at the liquid flow laboratory before the site calibration. 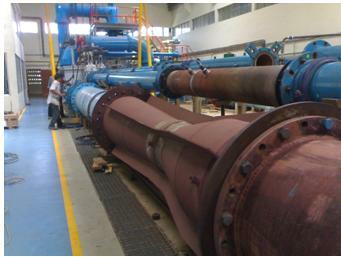 The mass flow meter was proved at five flow rates. The calibration results were satisfactory. 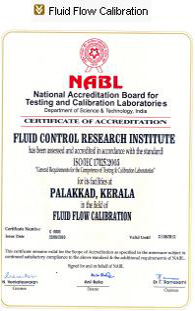 After the proving at site, the master meter was recalibrated at the FCRI liquid flow laboratory and the results are agreeable with the previous calibration.